Weighing just 1.1kg, this latest four-jaw chuck from The ToolPost is anything but lightweight. This model should be considered a serious contender for anyone looking for a scroll chuck for a smaller lathe. The chuck comes with two sets of jaws. The first set has gripper-type serrations in both expansion and contraction mode onto parallel spigot or recesses. The optimum size of the spigot for this jaw set is 38mm and the recess is 50mm. The second set also has gripper serrations for holding work down to about 15mm and has two sizes of gripper section in expansion mode - one at 25mm and the second at 38mm. This is useful for reverse chucking boxes and similar turnings to clean up the base. 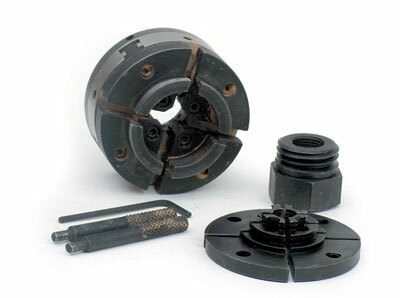 The chuck is supplied with a 1in x 8tpi thread in the body and also an adaptor bush to fit 3/4in x 16tpi. 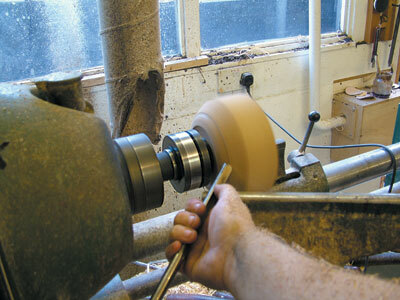 I used the chuck for a full day's turning, making small items like mortar and pestles and a few yew boxes. Personally I prefer my chucks to have chuck keys rather than tommy bars, but I understand that this additional manufacturing process will add to the overall price. It would probably also result in a larger, heavier chuck, defeating the objective of a chuck aimed at the smaller lathe. I always feel that you need three hands when operating tommy bars - one for each bar and the third hand to hold the work. Since few of us have three hands, some other method of holding these in place needs to be found. However, I found that I could use both tommy bars with one hand while holding the work with the other when I was compressing down onto a 38mm spigot. The tommy bars are a little small for my liking and, were this my chuck, I would turn two sleeves to fit over them. This would not be primarily to increase the leverage, although of course that would be an outcome, but if you are like me and a little careless as to where you put tools down, the tommy bars could quite easily be lost in a pile of shavings. I believe that at the price of Â£59.95 for the package - chuck body, two sets of jaws, tommy bars, Allen key and mounting bush - this represents exceptional value for money. "This represents exceptional value for money"